Last week was the first time in almost a year that I saw canned pumpkin on the grocery store shelves. I was pretty shocked that the pumpkin shortage has gone on as long as it has. I told myself that I would make my own pumpkin puree this year if I couldn't get my hands on any. Actually there are some stores that still so not have canned pumpkin in stock. If that's how it is in your area then this post is for you. It never dawned on me that making your own Pumpkin Puree was so easy. I assumed it was hard and time consuming, so I never even bothered to try. The whole process was pretty simple, but I did run into one problem. I did not know that the skin on sugar pumpkins was so hard. It was so hard that I couldn't even cut the pumpkins. I just assumed pie pumpkins were a different texture then regular Jack-O-Lantern pumpkins. To solve the problem I just roasted the pumpkins whole for about 20 minutes to soften up the skin. After they cooled a bit I cut off the stems and cut each pumpkin into pieces and placed them back into the oven a second time. Now I still don't know if fresh is better than canned because I froze all the pumpkin puree I made, but you can bet that I'll be making a recipe in the next couple days and I will let you know. 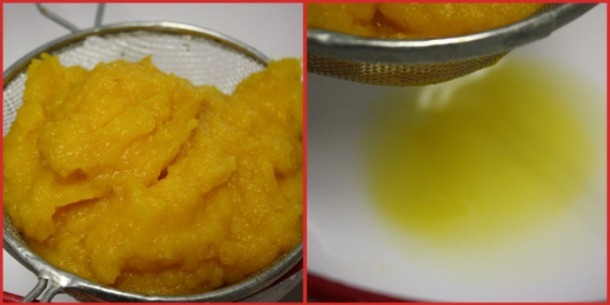 I have included some step-by- step photos of just how easy it is to make your own pumpkin puree. I hope you'll give it a try especially if canned pumpkin is still not available in your area. To start, preheat your oven to 350 F degrees. Slice the pumpkin in half and remove stem. You can cut the pumpkin into quarters if you want, or just leave it halved. Using a spoon, scrape out all of the stringy stuff and the seeds (save the seed if you want to toast them). Spray a foil-lined baking sheet with non-stick spray. Place your pumpkin cut-side down on the sheet. Cook pumpkin in a 350 degree oven for about 45 minutes or until its tender when pierced with a fork. When done, remove from oven and let cool on the baking sheet. Using a spoon scrape out the flesh and discard the skin/rind. It should be easy to scoop right out, Place pumpkin pulp in a food processor and process until smooth. I used the blade attachment to my Cuisinart hand mixer. You can also just mash it with a fork or potato masher. At this point you can use it in any recipe that calls for pumpkin puree or canned pumpkin. I froze mine in 2 cup measures in zip lock freezer bags. Most recipes call for a whole can which is 15 ounces so 2 cups will work out great. If the pumpkin puree is a bit watery you can strain it through a small strainer. If you're not using immediately store pumpkin puree in the freezer. I store mine in freezer bags and then add to one large freezer bag and lay flat. Preheat oven to 350 degrees. Slice pumpkin in half and remove stem. You can cut it in quarters if you want, or just leave it halved. Using a spoon, scrape out all of the stringy stuff and the seeds. (save the seed if you want to toast them) Spray a foil-lined baking sheet with non-stick spray. Place your pumpkin cut-side down on the sheet. 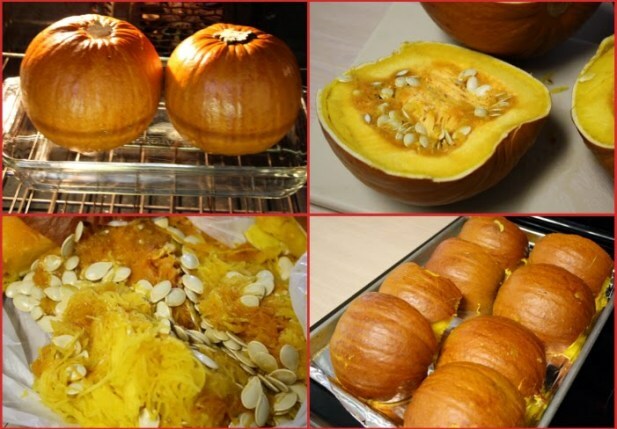 Cook pumpkin in a 350 degree oven for about 45 minutes or until its tender when pierced with a fork. When done, remove from oven and let cool on the baking sheet. Using a spoon scrape out the flesh and discard the skin/rind. It should be easy to scoop right out, Place pumpkin pulp in a food processor and process until smooth. At this point you can use it in any recipe that calls for pumpkin puree or canned pumpkin. I froze mine in 2 cup measures in zip lock freezer bags or small freezer containers. Most recipes call for a whole can which is 15 oz. If the pumpkin puree has a little water in it just place the puree in a strainer and strain off the water before storing. Cook's Note: If the skin of you pumpkins is really hard you can bake the pumpkins whole for about 20 minutes. Then remove from the oven let cool a bit and cut in half. Only you, my dear! Looks great, I'll have to try it. Thanks and have a great day! Its a hit and miss here, sometimes we have it and sometimes we dont! I'll keep this mind for the times they dont have it! Thanks! Do you know of any receipe that you can actually can the pumpkin and waterbath it? I dont have room in my freezer. I can't wait to try this! I'm actually baking your Pumpkin Sheet Cake right now and it smells delicious! I plan on trying all your pumpkin recipes. I just discovered last year that I like pumpkin...my mom never made anything pumpkin. All these years I've been missing out. Thanks for all the wonderful recipes! Mom Putnam I am not sure if you can actually can pumpkin puree or not. I read somewhere that pumpkin butter couldn't be canned saftley. Here is the article I saw it in. Looks like you could can the pumpkin if you cube it but not puree it. Which doesn't make sense because we are not adding anything to the puree besides a tad bit of water. Fabulous! Libby's has finally arrived here in Maine, but I think I'll be making my own puree as well this year. It's so easy! It actually tokk 3 stores before finding canned pumpkin.It was also a little on the spendy side. This sounds like a much cheaper way and just adds to the enjoyment of Fall activities! Thanks for the great idea. I'd been looking for pumpkin for months, too--also found it last week! I'll keep this in mind, though--I've had pie made from fresh pumpkin before and it was AMAZING. You can also use butternut squash to make "pumpkin" puree. Bet you can't taste the difference once you've added spices etc. It's also less stringy than pie pumpkins. Take care. It's good that you're posting this .. I made my own puree last year out of necessity and it made the absolute best pies I've ever eaten .. and that's no exaggeration! Hope everyone who reads this post tries to make their own this year .. take my word on it, it's awesome! I made pumpkin bread today with the fresh pumpkin. Everyone is right it is better than canned. I will buy some canned so i can use it in the summer and then use the fresh pumpkin in the fall and winter. We go through a lot of pumpkin in our house. Maybe I can get a good stash going in the freezer. I heard on the news today that my state's (VA) pumpkin crop is a good one- perfect for for putting some away in the freezer! How interesting! I've always heard that you should stir the puree over low heat for several minutes to get moisture out...I've never actually added moisture back in. I'm so excited. I can't wait to try it. We don't have canned pumpkin here yet. Thanks so much. I actually did this last year, one thing, after freezing the pumkpkin, there is still some water in it, so you may need to strain it again or the recipe may not turn out exactly as you would like. I did this with both pie pumpkins and field pumpkins. They both taste great, field pumpkins have much more water so it may look like a lot of pumpkin, but it is really only half of what you see. I really love your blog. We actually placed a call to Libby's to get the pumpkin scoop and they assured us that the canned pumpkin was on its way to stores last week. After the shortage last year though, we used our own puree and you're right - the flavor is so much better! Love these handy tips and step-by-step photos...thanks for sharing. I've done this every year for awhile. I never buy the canned stuff. This year, we gleaned a local pumpkin farmer's field for pumpkins for our pig. But we found a number of them that were perfectly good for human consumption. Not pie pumpkins though so a little different to deal with but taste the same. More moisture but after you cook it, put it in a colander lined with cheesecloth at least overnight in the fridge. And I use a hand mixer to puree it. Yeah Vicki and Joann. It is pumplin season so everyone will be so happy it's back. I always feel so blessed when Gooseberry Patch drops by and leaves me a comment. Thank you so much. About 4yrs ago when my middle son was 6 he asked for a "real" pumpkin pie, so I grabbed a can of pumpking and he freaked out. He wanted it made from scratch with real pumpkin. I was so scared that it would be hard, but it was super easy. I have never gone back to canned pumpkin again. 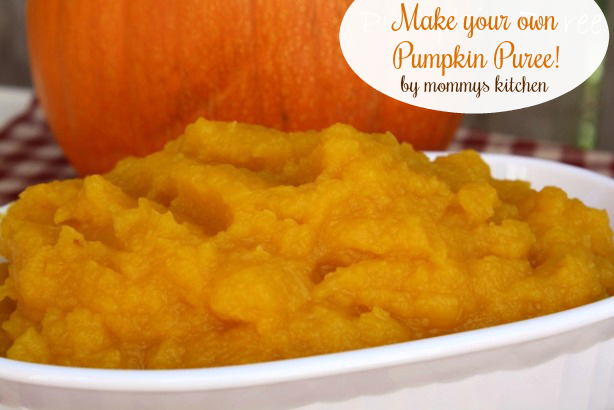 What a perfect time for pumpkin puree... and I love to avoid the can whenever possible! Thank you! I actually just discussed some non-traditional uses for pumpkin on my blog (http://northonharper.com/2010/10/pumpkin-more-than-just-a-pie/)... would love for you to check it out! We've got a whole garden full of pie pumpkins, just wondering how your pumpkin recipes turned out using this method i.e., pies, breads, etc. I am new to your site, but I sure like what I see! Oh boy I wish I was your neighbor!!! Since I have made my own pumpkin puree that is all I use now. All last year I did not buy any canned pumpkin. I prefer the fresh over the can now. Thanks Tina! I am trying my first batch of pumpkin puree today! How long does the pumpkin stay good in the freezer??? I like to put the dates that I need to use it by on my bags when I freeze things. Thanks! I looked online and it states about 3 months. That is all the information I could find on it. I have froze mine up to 6 months and they were fine. Just make sure all the air is out of the bags. I have frozen Jack-o-lantern pumpkin for years! I just cut it into lg chunks, pressure cook it for 4-6 minutes with 3/4c water at full pressure, let cool for a couple of minutes, then peel, bag in freezer bags, and mash with my hands. I will generally get 8-10 bags from a large pumpkin (I measure 2 cups per bag). LOL...I have pumpkin in my freezer from 2007! Hope this helps! Thanks for letting me know. I had just heard that the jack o lantern pumpkins were a bit grainier than sugar pumpkins. My puree turned out fine and it wasn't grainy at all. Glad you know I can use both types of pumpkins for puree. I forgot thanks for the information on freezing pumpkins. I generally try and use my frozen pureee within one year. You can also dehydrate your pumpkin puree, grind it in a food processor or blender and rehydrate it to save freezer space. 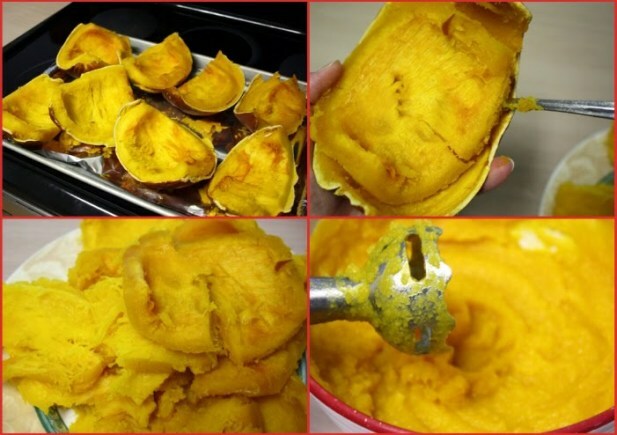 A "can" of dehydrated pumpkin is 1/2 cup dehydrated pumpkin with 2 cups boiling water added to it. You will have to let it sit for about 20 minutes or so until it rehydrates but it does work and you save room in the freezer! To safely cut pie pumpkins, I use the serrated cutters that come in pumpkin carving kits. They are totally safe and they work well. Fresh is soooooo much better than canned... it gives it a richer taste, lighter fluffiness to it. Canned makes a heavy, denser pie. I usually just use a pumpkin scraper and scrape out pieces of pumpkin, put it in the food processor and use it just like the canned. The jack-o'-lanterns made and pumpkin pies a cooking! Its tradition in our house!